Unlike a lot of couples, we went home the day after the wedding. We planned a month break between the wedding and honeymoon. And I'm SO glad we did! I can't even imagine having to pack for a honeymoon and the wedding at the same time. This break gave us time to reflect on the wedding, read all the cards, open gifts, and get excited all over again in anticipation of the honeymoon. After dating in different cities around the country and Caribbean, getting engaged, traveling around the world, & having an epic wedding what kind of honeymoon were we going to have? What could we afford? We started planning our honeymoon right after we got engaged. The honeymoon was actually planned prior to the wedding. Antoine chose the picturesque Bora Bora for our honeymoon location. Staying in an overwater bungalow in Bora Bora had always been a dream of his. We agreed that the honeymoon should be two weeks since we were traveling so far. I thought that staying in one place for two weeks could get monotonous. After deciding that the wedding would be in November, we started looking for additional cities to add to this trip that would be relatively close to French Polynesia. I LOVE fireworks and since our wedding was near the end of the year we decided to bring in the New Year on our honeymoon. We settled on Sydney, Australia first to see the fireworks at the world famous Sydney Opera House and Harbour bridge, followed by Auckland, New Zealand and finish up the trip with a week in Bora Bora. Determining logistics and flights times between all of these locations was no small feat. People often ask if we use travel agents. No, we plan our trips ourselves. We use price trackers to wait until costs go down and we use points as much as possible. We were able to leverage points for the flights and hotels in Australia and New Zealand, so there was no additional cost except for our activities at these locations. To get to Australia we had an all day layover in Los Angeles. This was perfect. We didn't have a chance to visit LA on our engagement tour. We leveraged our layover to meet up with a few friends. So now off to the other side of the world. The flight to Australia is LONG, about 15 hours. You really want to do this in first or business class, but if that's not possible don't let it stop you. Go anyway. It's best to leave late night so you can sleep most of the flight, then when you arrive in the morning your body is already adjusted. We absolutely loved everything about Sydney! It's like the best of Los Angeles and San Francisco. It's a great walking city. There's wonderful shopping and lots of delicious Asian food. It's a beach town, with the most perfect views and beautiful people. We spent four days here, including New Years. It's was Australia's summer and it was hot. Darling Harbor: Imagine Washington Harbor, Baltimore Harbor, Norfolk Waterside, San Diego at their pinnacle. Restaurants, shops, boats, museums and the movie theater…the perfect place to take a stroll and enjoy the view. Shopping: Our hotel was in walking distance to Westfield Sydney and street shopping. Sydney has all of the high end stores that Raleigh doesn't. Unfortunately I left my heels on the airplane from LA so I had to buy shoes for NYE. Antoine spotted a Christian Louboutin store and that was how I ended up with my first pair of red bottoms. Circular Quay: This is the area of Sydney you imagine when you think of Sydney. It's right on the water and home the Sydney Opera House and the Opera Bar. The botanical gardens is also a convenient nearby walk. We walked this area a lot and spent New Years Eve at the Opera House. New Years Eve: Antoine always wanted to see an Opera at the Opera House. We purchased a package that included dinner at the Sydney Opera House catered by the renowned Aria, followed by The Opera "La Boheme", the famous fireworks on the balcony of the Opera House overlooking the Sydney Bridge and lighted boats circling the harbor, followed by an after party that included a live band in the lobby of the Opera House and the live music party outside. This night was everything you could imagine it to be. Dinner included meeting couples from all over the world, learning their life stories. One couple had taken a year off and was traveling all over Australia because their "savings had gotten too high". Yep, you heard that right. We had to clarify if we heard them correctly as this is a concept that we can't even comprehend. Antoine enjoyed the Opera so much that he immediately booked a trip to the Met in NY for us and his parents. Unfortunately, I slept through the entire thing. I think I saw two minutes of the opera. One lesson learned, is not to eat heavy nor drink prior to attending an Opera. The music was like the perfect lullaby and the fact that they basically had a champagne IV pumping into us nonstop prior to the opera didn't help. 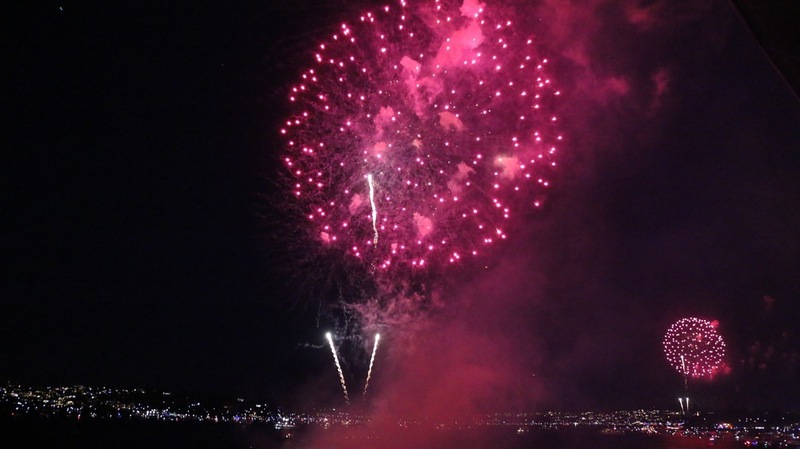 We enjoyed the 9pm fireworks show at intermission,another fireworks show at midnight and the afterparty until 2am. This was a bucket list item for us, so although the cost was high, the experience was priceless. There are plenty of free places to watch the fireworks, you just need to arrive very early in the day to secure a spot. The Opera Bar is another popular place to spend NYE, that runs about $400/person. Bondi Beach and Bronte Beach: Bondi is the Santa Monica and Manhattan Beach of Australia. Expect perfect bodies and tans. You'll find surfers everywhere. Bronte is more of the family beach. There is a grassy area for picnics as well. I actually found Bronte more scenic. It has an amazing rock pool where the ocean waves crash right into the pool and beautiful cliffs of various colored stone. Bridge Climb: On New Years Day after the beaches, Antoine suggested we climb the Sydney Bridge. I was not excited about spending money to sweat and feel my leg muscles burning. This activity would have us climbing stairs for two hours, meanwhile I don't enjoy climbing two flights of stairs. But, marriage is about compromise, so I'm all in and boy was I glad we did this. The best view of Sydney is from the top of the bridge structure. The guides are fantastic and tell the history of the city and the bridge. Everyone wears jumpsuits for safety and headphones to hear the guide. Climbing was no fun, but it was definitely worth it! We were only in Auckland for two days. As New Zealand is the birthplace of bungee and world renowned for adventure activities I wanted to bungee jump off of the Auckland Bridge. We weren't exactly on the same page with me bungee jumping and the weather wasn't ideal as it rained most of our time there. So we took time to relax and chill after our nonstop time in Sydney. We spent a day on Waiheke Island. Waiheke Island: The boat ride to Waiheke is amazing. Looking back on the city and the green hilly islands paints a smile on your face. Waiheke Island is known for it's wineries and vineyards. We went to Mud Brick and Cable Bay. Both have incredible views. Cable Bay is known more for their white wines and rosé. As a red lover I, preferred Mud Brick. We sat outside overlooking the green rolling hills and enjoyed our wine and a cheese plate. Mud Brick hosts many weddings as it is the perfect setting. After wine tasting it was time for lunch. We love to frequent local spots on our travels to avoid tourist traps and the food is usually better. Our driver suggested Vino Vino. This was a quaint spot in town and the food was reasonably priced and delicious. Originally we planned to stay at the Hilton Bora Bora but as luck would have it, they were going to be under construction on the dates that we planned. The reservations manager called and asked us if wouldn't mind being moved to the St Regis Bora Bora. "Uhhhh, YES!!!!" We had no problem with that because it is where we originally wanted to stay but the cost was prohibitive. Won't He do it! This would be the perfect finale to our honeymoon. In order to get to Bora Bora you take a small plane from Tahiti. The airport in Bora Bora is right on the water. Hotels boats that pick you up right at baggage claim and you sail away to your hotel. The St. Regis Bora Bora was secluded, romantic and luxurious. The water was turquoise and clear. The service at the St. Regis was top notch. All of the overwater bungalows are a minimum of 1500 sq ft. Their butler service was the icing on the cake. Every morning our butler brought us coffee or tea and the morning news. The resort has bicycles to ease transport from one end to the other. Our favorite spot was the Oasis Pool, which has several private cabanas and mini pools. They have several activities which include but aren't limited to jet skiing, sailing, diving, private sunset dinners on the beach, kayaking and so much more. There is an in water hammock that is off in one of the many private areas as well. Our last night we enjoyed a Polynesian show. The thigh work of the men was hilarious and impressive. If Eve got her eagle on, they were getting their hummingbird on. This was by far the most impressive place we have been thus far.